In 1997 theoretical physicists with the Lawrence Berkeley Laboratory at the University of California postulated that there should exist an upper limit of the critical temperature in the superconducting copper-oxides "in the region of 160-170K"*. Subsequent to 1997 that limit was increased to 200 Kelvin. Now it appears the limit may need to be raised to 220K - or higher. Superconductors.ORG herein reports signs of superconductivity over 212K by doping a recently-discovered 200K tin-copper-oxide superconductor with a small amound of indium. The improved formula becomes (Sn5In)Ba4Ca2Cu10Oy. 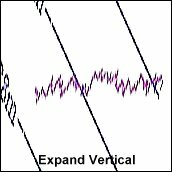 Although the 212K phase forms as a very small volume fraction within the bulk, sharp resistive and diamagnetic transitions are clearly visible when multiple tests are digitally summed together (see graphics at page top). The first attempt to dope the tin atomic sites of Sn6Ba4Ca2Cu10Oy with Pb (lead) produced a Tc drop. And the results of Tl (thallium)-doping were ambiguous. However, doping 25% of the Sn atomic sites with In (indium) immediately produced two new phases: 208K and 212K. Later, after isolating the 212K formula, a 206K phase also appeared. Since 25% of 6 Sn atoms equates to equal amounts of (Sn4In2) and (Sn5In), these were presumed to be the phases generating the 208K and 212K signals. 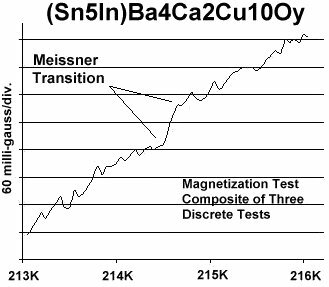 Through trial-and-error, the (Sn5In) phase was then identified as the source of the 212K superconductivity; while the overdoped (Sn4In2) was responsible for the 208K signal. The (Sn5In)Ba4Ca2Cu10Oy structure is believed to be B212/1212C - the same as for Sn6Ba4Ca2Cu10Oy (see graphic at left, where B=11 and C= copper chain). Both the ionic radius and atomic weight of indium are comparable to tin, making it an ideal hole dopant for this compound. The 206K phase appeared only in tests that included a single atom of indium per unit cell. 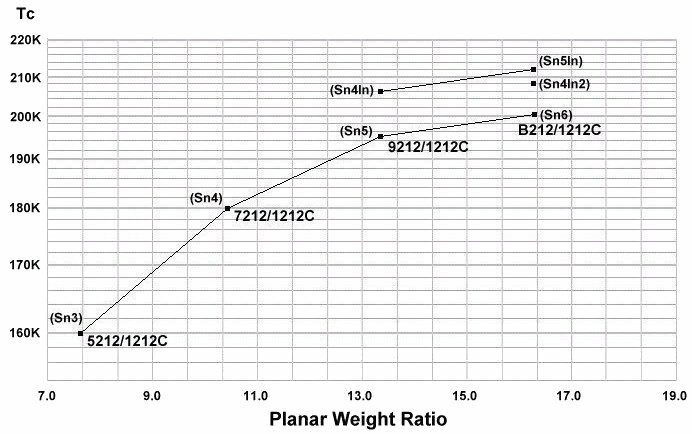 When plotted in accordance with the Tc-v-PWD (planar weight disparity) graph below, the 206K signal was determined to be a result of the 9212/1212C structure type (Sn4In). Spotting the superconductivity signature of these minority phases proved a considerable challenge, as their volume fractions - and, therefore, their signals - were extremely low. The method used to identify a superconductive transition within a high noise background is shown below. This magnetization plot shows a Meissner transition appearing near 220K. 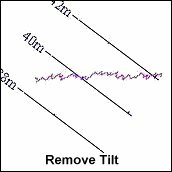 The first step in searching for a sharp transition buried in noise is to rotate the plot (Remove Tilt). Then adjust the aspect ratio so that the vertical is accentuated (Expand Vertical). Lastly, superimpose a line through the average noise and look for a shift in level (Superimpose Lines). Once a level shift is located, multiple tests can be digitally summed together to resolve a signal within that range of temperatures. 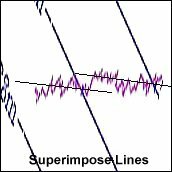 Summing improves the signal-to-noise ratio (S/N) because the noise adds as a root-mean-square function (being out-of-phase), while the superconductive transitions sum arithmetically (being in-phase). 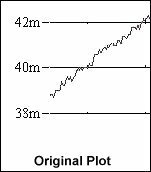 This improves the S/N by 3db with 2 plots, 4.7db with 3 plots, 6db with 4 plots, etc. Initial variations of the stoichiometry to include more copper suggest the 218K superconductivity signature (220K magnetic shown above) results from a B212/2212C structure type. 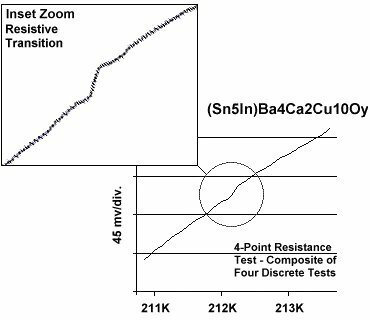 Tests show that adding another copper atom to the unit cell reduces the 212K signal, while strengthening the 218K signal. To read more on this, click HERE. Synthesis of these materials was by the solid state reaction method. Stoichiometric amounts of the below precursors were mixed, pelletized and sintered for 36-60 hours at 830C. The pellet was then annealed for 10 hours at 500C in flowing O2. * V. Kresin, et al, Phys. Reports 288 - 1997.